March 7 2016. 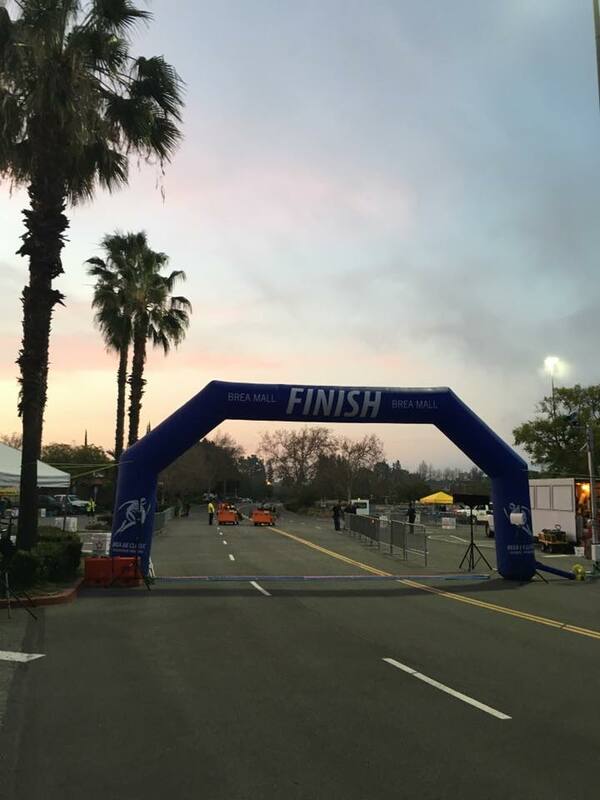 USATF Masters Long Distance Running kicked off the road portion of their Masters Grand Prix with the USATF 8K Championships at Brea CA on Sunday February 28. As usual the late February temperatures were Southern California perfect. It was a nice road trip for those from northern places with snow and ice. The breezes were mild as well, but there was presumably more humidity than normal. An unexpected morning fog blanketed the course before burning off for the citizen’s race at 8 am. Most repeat runners reported after the race that their time this year was a half to a full minute slower than last year’s. No records this year but lots of competitive races! Note 1: All times given below are chip/net times. No gun times were recorded. Women. Julie Ertel who finished 5th last year was on her game as she took the women’s crown this year in 29:43. Eight seconds later, Nathalie Higley crossed the line so we know that was a battle. Higley, by coincidence, had finished 5th in the 2014 edition of this race. Nicole Hagobian, new to the Masters ranks, but a 2008 and 2012 Olympic Marathon Trials veteran, took home the bronze in her first USATF Masters Championship race in 30:09, claiming the third podium spot by a mere 2 seconds over Mariam Ngo who stepped up her game since last year when she finished 13th. There must have been a terrific sprint to the finish line! Ertel 29:43 Higley 29:51 Hagobian 30:09. 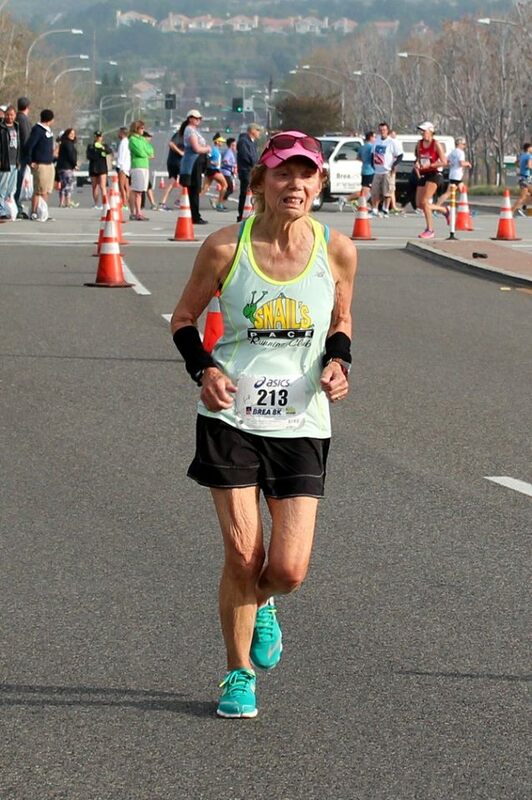 Edie Stevenson, 66, had the highest age-grading score on the day, 92.7%. Second and third for women went to 58 year old, Suzanne Morris 89.1% and with 88.1%, 67 year old Jo Anne Rowland. Just off the age-grading podium were Louise Davis, 55, 87.8% and Nathalie Higley, 46, 87.3%.The Overall Age-Grading contests on the men’s side were exceedingly tight again. 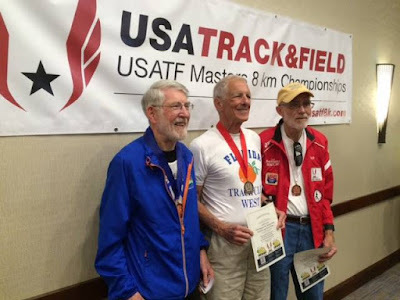 The podium consisted of 64 year old Tom Bernhard 91.7%, 61 year old Rick Becker 91.6% and 48 year old Christian Cushing-Murray 91.2%. Just off the podium with scores of 90.9% and 90.4% respectively were Carl Combs, 50, and first across the finish line, Greg Mitchell. M45. Christian Cushing-Murray who finished 4th overall and nabbed the bronze age-grading medal, claimed his second podium finish this year. 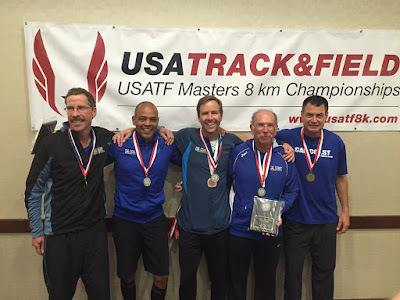 Second at the USATF Cross Country Championships in Bend Oregon, ‘Cush ‘took the M45 gold here. Andrew Duncan stayed close for a while but eventually Cushing-Murray pulled away to win by nearly 20 seconds. W60. Honor Fetherston finished 2nd last year to Christine Kennedy’s record-setting performance. This year Fetherston had a dandy win, taking first with room to spare. Madson Buchbinder followed her across the line 45 seconds later in 2nd. Again there was a terrific duel for third and 4th with Sandy Robbins-Synder pulling away from Elizabeth Sponagle to claim the bronze medal by 11 seconds. Fetherston 35:54 Buchbinder 36:39 Robbins-Synder 38:20. M85. Like last year this was a solo event for 87 year old Gunnar Linde who claims the distinction of being the oldest gold medal winner of the day. Perhaps he will face more competitors next year as the other 2014 solo winners experienced in 2015. Linde 52:12. 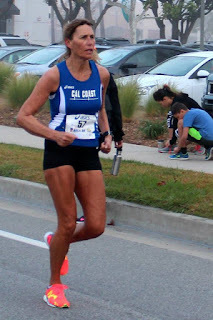 W40+: This was a race between Northern Cal’s Santa Barbara Running and Racing (C. Abrami, J. 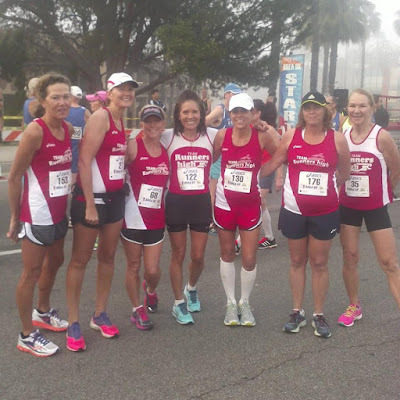 Brown, D. Mandarino, L. Paulick) and two Southern Cal teams, Jane’s Elite Racing (T. Fischer, K. Cushing-Murray, K. Taylor, I. Walters) and Cal Coast Track Club (L. Davis, M. Lynch, J. Sweningson, K. May, D. Keyes). Abrami and Brown came in 1-2 only 9 seconds apart to give SB a great start. But then the Jane’s responded with Fischer and Cushing-Murray coming across 3-4 nine seconds and then another 44 seconds back. But when Mandarino came over the line next, that gave the gold to Santa Barbara. Taylor was the next runner in, slamming the door on Cal Coast. Jane’s Elite took silver while Cal Coast enjoyed a bronze medal. 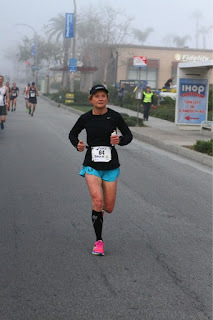 Santa Barbara Running and Racing 1:34:52 Jane’s Elite Racing 1:36:06 Cal Coast Track Club 1:40:16. M50+. Cal Coast Track Club owned this division with their ‘A’ (R. Arsenault, J. Ambos, T. Schumann, D. Arsenault, M. Salzman) and ‘B’ (G. Quinonez, A. DiConti, R. Knerr, B. Brisco) teams taking gold and silver. 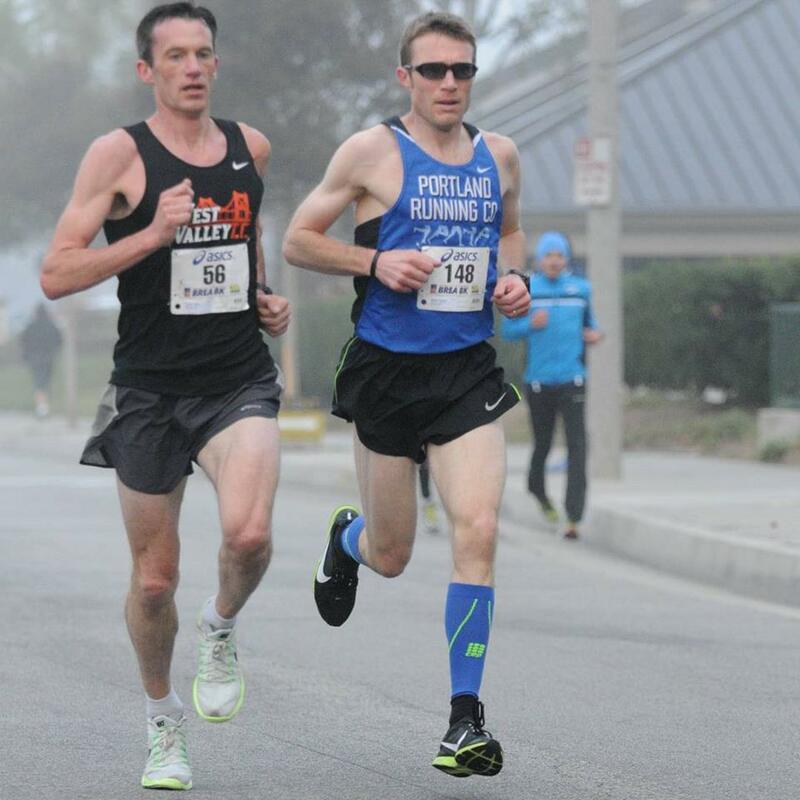 A Snail’s Pace (K. Broady, M. Donaldson, J. Alvarado, J. Vara) put up a battle, with Broady breaking up the Cal Coast Runners. But all 3 of the A team and all 3 of the B team came in ahead of the other 2 Snail’s Pace runners. Cal Coast’s M50+ team finished 4th in the 2015 Club Grand Prix, running only 3 events. 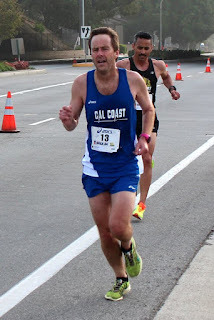 Rob Arsenault said to let the other M50+ teams know that this year Cal Coast is committed to running 5 events and they plan on winning them all. Cal Coast A 1:23:30 Cal Coast B 1:24:58 A Snail’s Pace 1:28:13. W50+. A Snail’s Pace (S. Davis, D. Okano, M. Broady, Y. Darcy, J. Gardelle) brought a strong team that took the gold by a wide margin. Team Runners High (S. Morris, M. Buchbinder, K. Lander, L. Lyons, R. Bonifacio) made it interesting for a while as Morris slipped in between Snail’s Pace’s 1-2 punch of Davis and Okano. But once Okano and Broady came in before TRH’s Buchbinder, the handwriting was on the wall. Club Ed Running claimed the bronze medal. 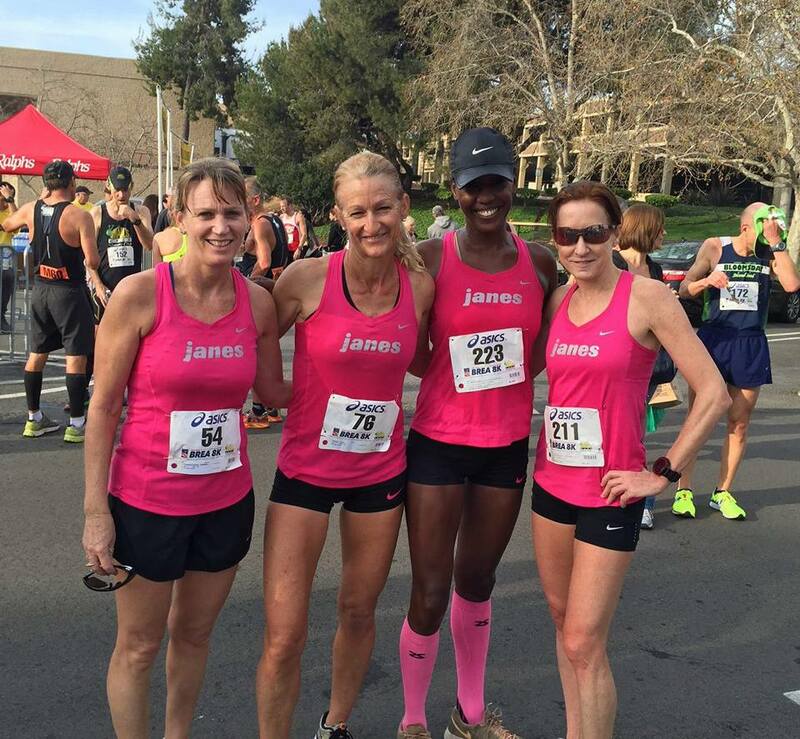 A Snail’s Pace 1:44:16 Team Runners High 1:48:13 Club Ed Running 2:19:10. M60+. The hometown heroes took this division too as Cal Coast A (D. Campbell, K. Witthauer, J. Holcomb, P. Forrester, S. Lassegard) and B (P. Cook, C. Sanchez, J. Salzman, W. Sumner, J. Combs) strode to a 1-2 finish. They were expecting strong challenges from the 2015 Club Grand Prix Champion Boulder Road Runners (D. Bell, H. Hibbard, J. Frisby) and New Jersey’s Shore AC (R. Stirrat, I. Broady, P. Gaughan). Unfortunately neither challenge materialized. 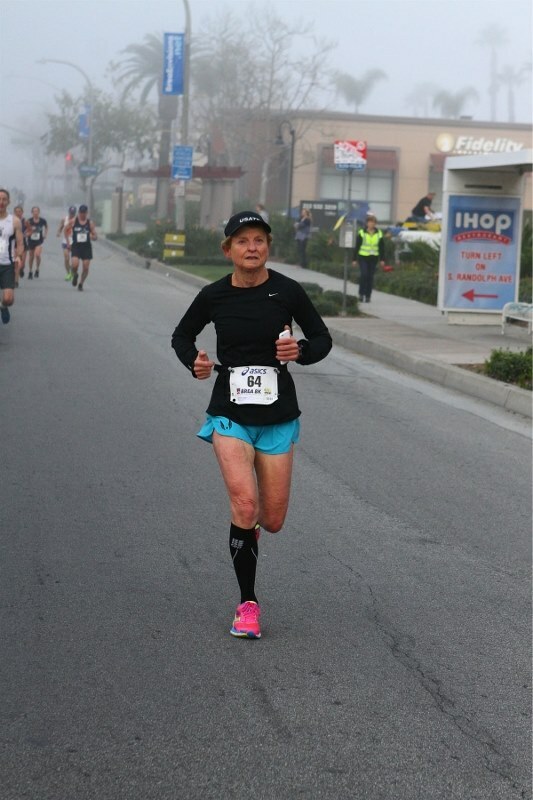 One of Shore AC’s runners, Broady, strained a muscle on an easy training run the morning before the race and could not run. So no score for Shore. 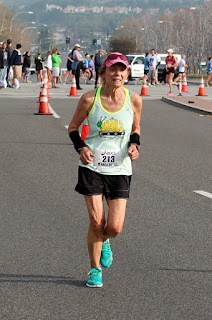 BRR had expected to come with John Victoria as their 3rd scoring runner with 71 year old Jan Frisby as back-up depth as he did not have his usual fitness. Unfortunately Victoria’s back acted up in the week before the race and he scratched. Had Frisby been anywhere near his normal self [32:24 last year on this course] Boulder would have made it interesting, at least for silver. But Frisby’s self-assessment of his fitness was accurate and Boulder had to settle for the bronze medal. 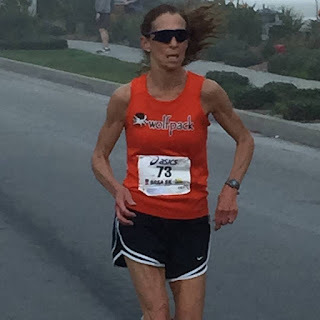 Cal Coast A 1:28:25 Cal Coast B 1:39:27 Boulder Road Runners 1:41:19. W60+. This division too was a classic NorCal/ SoCal battle as the Impala Racing Team (J. Rowland, J. Cain, D. Chan, M. Fillmore, D. Anderson) from the Bay area and the local A Snail’s Pace (E. Sponagle, K. Guiney, P. Wusthoff) team went head-to-head. Impala took the early lead with Rowland’s 38:13. But the Snail’s came back with Sponagle 18 seconds later and Guiney 19 seconds after her. A couple of minutes later Impala’s Cain and Chan came in within ten seconds of each other and that sealed the gold medal win for Impala. Impala 1:59:59 A Snail’s Pace 2:03:43. M70+. The sterling Tamalpa Runners team (L. Goldman, H. Schmid, F. Martin, B. Cowdrey) had this race well in hand from start to finish. But it was a tight battle for 2nd between Club Ed Running (P. Wickens, J. Clarke, M. Tarnay) and Florida Track Club West (J. Callaway, H. Goforth, J. Metts, R. Williams). 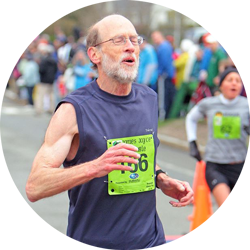 Unfortunately for FTC West, their top runner, Ron Enos, went down in the first 1/ mile of the race and was unable to continue. But next man up is the motto. Between these 2 teams, Club Ed’s Wickens was in first in 39:00. Thirty-five seconds later FTC’s Callaway came in. A minute and change later his teammate, Goforth crossed the line and things were looking good. But the next two runner in were Club Ed’s Clarke and Tarnay and that was enough to get the silver medal with FTC taking the bronze despite adversity. Tamalpa Runners 1:48:51 Club Ed Running 2:05:03 Florida Track Club West 2:07:01. W70+. A Snail’s Pace (N. Thomas, J. Gardner, P. Herr, V. Noguer, D. Strand) took the gold medal in this division unopposed. A Snail’s Pace 2:36:09. M80+. The San Diego Track Club (W. Osborn, E. Gookin, W. Crum) won the gold medal without opposition. Hat’s off to the oldest team to win a gold medal at this race. 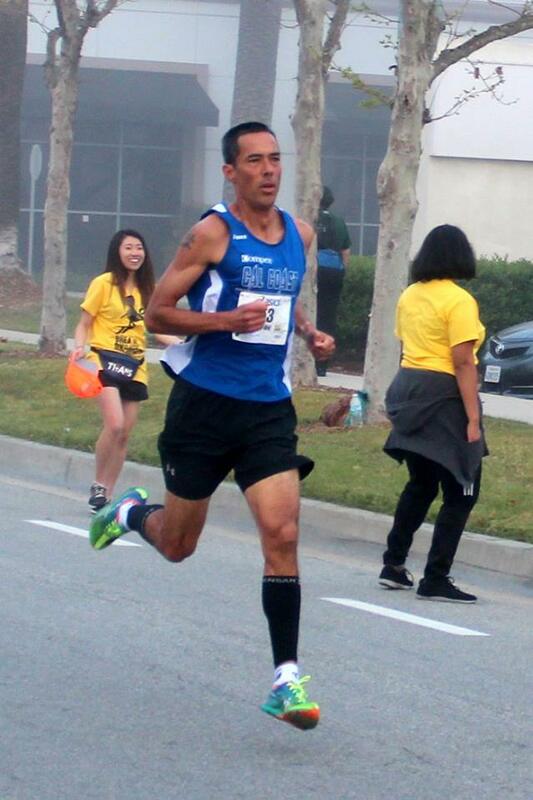 San Diego Track Club 2:44:08. *Age-Grading Results were not available at the time of the Awards Ceremony. Newly designed and produced 2016 Elite Performance Medals will be mailed to the winners. 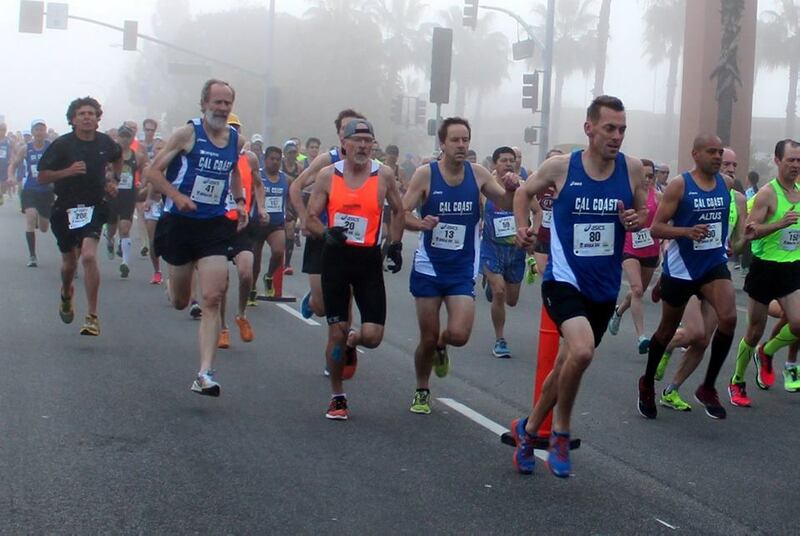 Other teams in contention: Team Runners High 32, Impala 39, Cal Coast 41. No other teams were within 20 points of the third place team. Had Brian Pilcher been competing as part of a Tamalpa 40+ or 50+ team, along with Schmid and Goldman, they would have been taken 2nd place—but not so. Note: The Brea Classic Race Committee took the option again this year of using chip time/net time as the determinant of places and awards. There were no cases where chip times and gun times would have resulted in a different finishing order but there may be cases where the gap between two competitors looked bigger or smaller than the official finishing times suggest. In most cases, competitors would have started within a few seconds of each other. Still one might hope that in the future officials at the starting line do more to encourage competitors in each age and gender group to find each other and line up close enough so that chip time and gun time are almost equivalent. I would not be in favor of physical corrals but verbal encouragement to form virtual corrals might be useful. Thanks for the comment, Heath! Yes, in USATF XC Meets, it is position that determines scores but in the Road Races they add up the times. It is more critical to beat your competitor in the XC races. Those who like using the times emphasize that whether there is a runner from another team right in front of you or not, you have all of the incentive to sprint for the finish because every second counts! Sounds like you had a terrific battle with Holcomb--Great fun even with the roller coaster of emotions after the event. Paul, Happy to discover your blog and to chat with you after the race. I must admit the elation probably got the better of me when I made such a bold statement. But I won't back away from it. 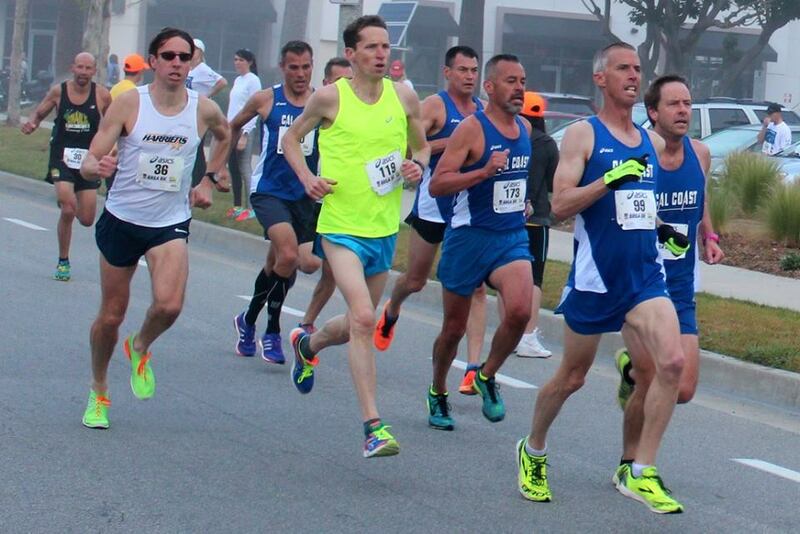 I look forward to the friendly and fierce competition that is Masters running. 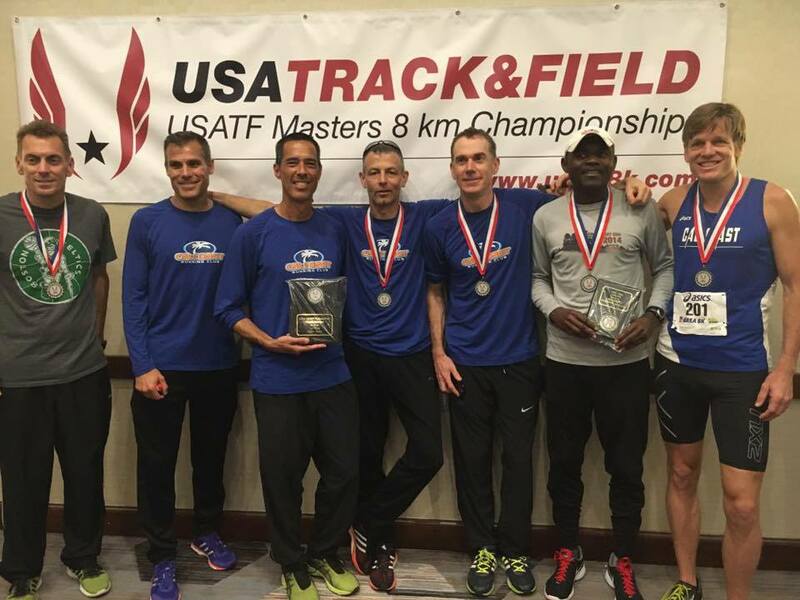 These guys like Carl and Robert, ATC and Bowerman and our brothers at CNW, and the boys at Genesee and Playmakers, are incredible and I'm just happy to toe the line with them. But I am happier to beat them. ;) The only thing that quells my fear of these great competitors is knowing I'm toeing the line with my boys. We're ready. PS. Look forward to keeping your blog in with my favorites. Rob. The trips always depend on Funds, Fitness, and Family commitments. Funds: Tallahassee (Clubs) is a must fund. After that for me is one, maybe two, others if the airfare can be bargained with. I enjoyed Tulsa last year but that is more than likely the 3rd trip dependent on cheap flights. The guys and I are strongly considering Syracuse (Road 5k). I'm going into this year's Carlsbad somewhat lame so I'd really like to find another fast road 5k to make that up. Guessing though that we will all get our doors blown off by McManus or Wade or both but where's the fun in anything else. Other than that, I'm trying to talk our smoking fast milers (Knerr, DiConti) to go to Michigan though without smoking slow me. Fitness: Bad news is, we lost Ernst after Clubs, Olds for Bend, then Ambos after Brea. Good news, we get Magill back at Carlsbad (hopefully after a few beers in the garden we'll talk him into running San Diego), Olds for San Diego, and we age up a few guys this year. 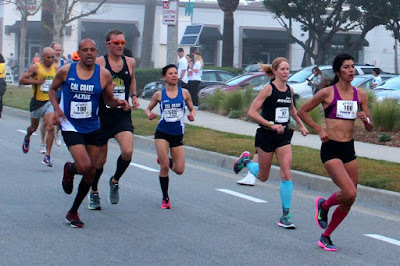 I had a mishap the week after Brea with my hamstring that has put me very tentative but I will give Carlsbad a go anyway. I'm not figuring to be able to go too fast but just hoping to be able to run hard. Family: What the wife allows, or what I can hide from her (read: Nothing), is fair game. Hope to see you soon. Rob.